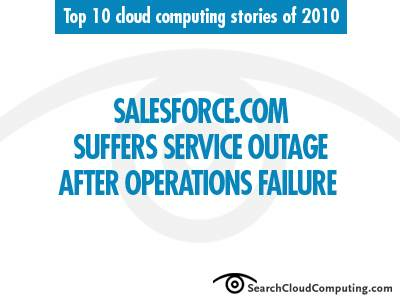 Salesforce.com's January outage had almost all its customers experiencing an hour of downtime, ensuring that it would be one of the biggest cloud stories of 2010. In a year packed with high-profile cloud computing outages, one of the more memorable was Salesforce.com's hour-long January incident. The Software as a Service (SaaS) leader said that "systemic failure in its data center took out both normal operations and backup systems," a hiccup that brought the entire service down. The outage also raised questions about Salesforce.com's aggressive software lock-in, a practice that keeps the company's Force.com platform tethered to Salesforce.com's own services. But in the end, it was just another reminder that 100% reliability, in regard to cloud services, remains a work in progress.